After you login, you arrive on main page as shown below. The upper tab contains buttons for navigating around the website. Select create from top row. The Add Content page as shown below allow you to upload Webpages, photos, and documents. The editor bar shown below contains some very useful tools. It is located at the top of the every page. It allows, you to add further content, arrange content, record audio, add notes and view page details. The timeline enables you to synchronize the background audio with your slides. This page lets you manipulate with all the content that you have added to your flowgram. It contains all the pictures, web pages and attached documents. You can upload audio files through your hard rive or even add narration using the record button available on the Editor Bar. The timeline as shown in figure 6 enables you to synchronize the audio content with highlighted sections of your flowgram. This way you can allocate time duration for a particular slide. The timeline is shown below. 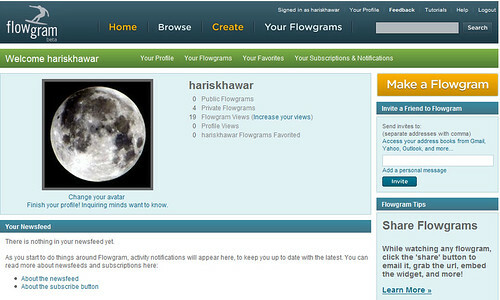 Send links of your flowgram to friends and family members on their email address. Make the flowgram public so that the entire world can access it. Paste the flowgram link on personal site, blogs and IM clients. 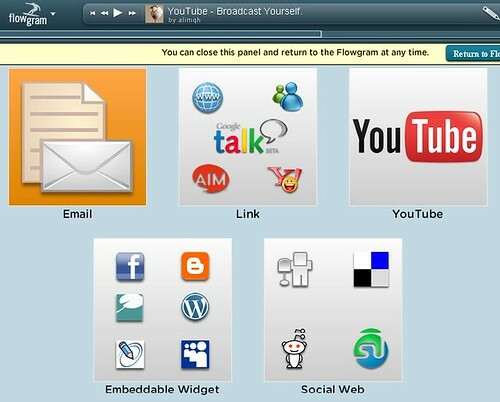 Post a flowgram widget on Facebook, MySpace, Orkut, Blogger, LiveJournal, IGoogle and many other social networks. 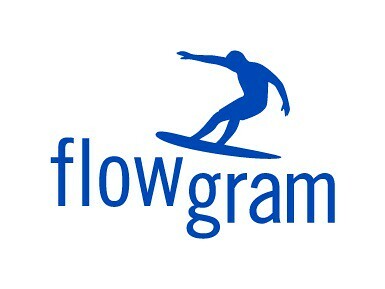 Although flowgram is still new on the horizon, people have used the tool to their advantage for many things. Flowgram finds its application in the field of education in form of online lectures; students are finding the interactive and user-friendly environment of flowgram beneficial for their studies. Training aids are also being developed through flowgrams; consider the flowgram on Marketing. Users have been greatly inspired by the features of flowgram and are using them to create website- walkthroughs, tutorials and advertisements. Photo-sharing with friends and family has become ever so easy; people can gather their pictures from different social networks and combine them into an album to share with their loved ones. 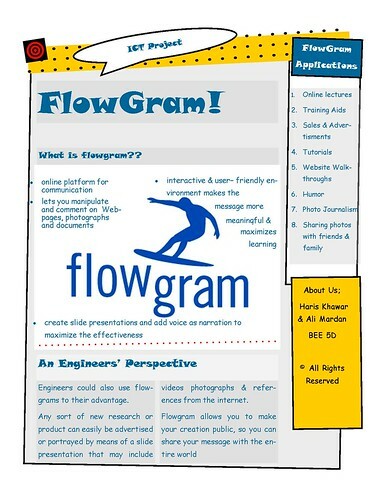 Flowgram is an online tool for communication. It uses web pages, videos, photographs and documents to make presentations. Creating flowgrams is quick and simple. Engineering student and professionals have both used flowgram to their advantage in spreading knowledge. The tool has many application including website-walkthroughs, presentations and tutorials. The figure below summarizes the whole content of this article.